I thought I would share some Harry Potter projects that I finished recently. 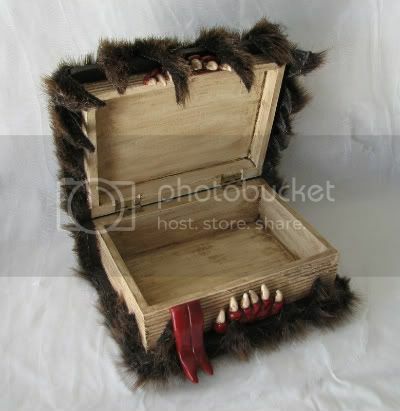 The first one is a Monster Book of Monsters box. My second project is an older one from the Harry Potter Holiday Swap. It is a ribbon box that was inspired by the Quidditch trunk in the first Harry Potter movie. I created it from an old jewelry box that I found. As soon as I saw the thumbnail I was like "HARRY POTTER! Must click!" You are incredibly cool for making the Monster Book of Monsters. Totally agree! I knew exactly what it was when I saw the thumbnail. 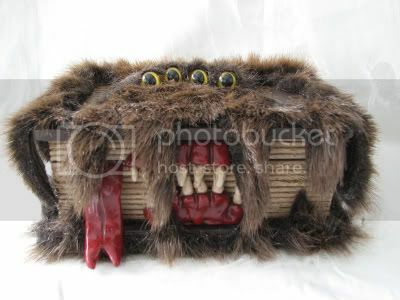 <333333333 Monster Book <3333333333 Seriously love this and the quidditch trunk!! The part of my heart in charge of my Potter love (which, incidentally happens to be most of it) just exploded. The monster book is brilliant - completely inspired! And the quidditch chest... I would love to have something just like that on my dresser, in fact I might borrow the idea to use on an old wooden box that is quite naked at the moment. You are brilliant - and have done an amazing job, seriously amazing and you've really made my day!